The Thuringia Route of Human Rights and Democracy was created on the 20th anniversary of the Thuringian Constitution of 25 October 1993 and currently connects 20 memorial sites of historical significance such as Worbis, Jena, Altenburg, Greiz or Gotha, which are accompanied by other well-known memorial sites and border museums. Think about human rights and democracy in Thuringia and the first places that come to mind are Wartburg or Weimar. There is, however, much more to discover. For example, the Thuringia Route of Human Rights and Democracy introduces you to events, locations and individuals whose memory, although fixed in the collective consciousness of those living here today, may yet be lost to future generations. The route tells the story of the state of Thuringia and its worthy legacy of civil courage, human rights and democracy. The historical traces may, however, be difficult to see at first glance as there were many silent or hidden witnesses to the development of democracy and human rights here. On this route, you will encounter places such as the square where the people once met to form an alliance against a despotic government; a hideaway where persecuted people were hidden or a house where like-minded people met to contemplate society's development. One such location is Schwarzburg in the district of Saalfeld-Rudolstadt. This is where Friedrich Ebert, the President of Germany, signed the Weimar Constitution in 1919, thereby creating the first democracy on German soil. Another is Heiligenstadt, the town which was home to Hugo Dornhofer (1896-1977), a politician who remained a staunch democrat through two dictatorships. Other notable sites include the Holzmarkt in Jena, the scene of mass protests on 17 June 1953, and Großbreitenbach where the 5th Thuringia People's Assembly, part political event and part fair, was held, and which was also one of the towns involved in the March Revolutions of 1848. The memorial sites at Point Alpha in Geisa or Greiz where the first privately registered and officially authorised demonstration in East Germany (the GDR) took place during the Autumn Revolution in 1989 are also sites of incomparable historical significance. Human rights were abused and democracy defended in a large number of Thuringia's towns and cities. Go on an exciting and interesting quest into the roots of democracy and human rights, and find out just how long and multifaceted Thuringia's historical struggle for each has been. 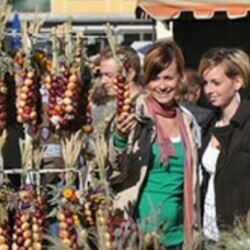 Weimar's Onion Fair is held on the second weekend in October. It is Thuringia's biggest fair and onions are the stars of the show – not merely cooked in flans and soups but also plaited and made into decorations. The atmosphere hots up on the Saturday with a race through the heart of the fair, and there's live music on five large stages for three whole days. Johann Wolfgang von Goethe was apparently a regular visitor to the fair when it was already more than a hundred years old. All information om priser, datum och öppettider med förbehåll för ändringar.